This page will hopefully be an image page, with whatever imagery we can find (or you perhaps can provide) on the subject of the Volturno disaster. Images on the subject are not however easy to find, so the page will likely remain small for quite a while to come. But we already have three more pages. Pages 28, 29 & 30. To start the page off, I provide a postcard image of 36 of the surviving crew members of the Volturno, taken on or before the 18th of October 1913 since on the afternoon of that day they all left for Southampton on the Oceanic. 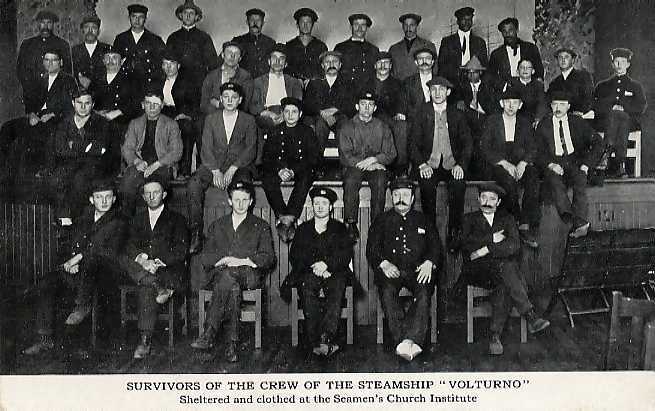 The caption reads "SURVIVORS OF THE CREW OF THE STEAMSHIP VOLTURNO" and "Sheltered and clothed at the Seamen's Church Institute". Now that must mean the Institute of that name on Water Street in New York City, which I learn is still active today after having served mariners since as far back as 1834. It would be wonderful if any of the individuals in the image could be identified - but that may be too much to hope for. Captain Inch would not be in the photo, since he and Chief Engineer Robert Dewar stayed elsewhere. The postcard was sold on e-Bay in late May 2003 and was bought by a friend of this site who has kindly provided the following fine scan. Firstly I am delighted to be able to show you, thanks to a friend in Europe, an image of an undated work by G. (Georg or maybe George) Martin. It was published in a German magazine, I believe in Aug. 1914, and that magazine may well be entitled 'Das Buch f�r Alle' (The book for all). At the foot of the black & white work are these words - 'Der Brand des Passagierdampfers �Volturno� auf hoher See. Originalzeichnung von G. Martin. (S. 174)'. 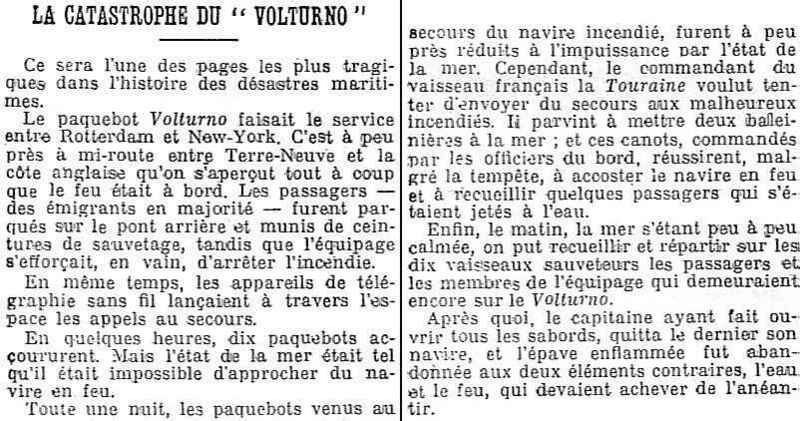 I do not speak German, but I think that means 'The fire (or burning) of the passenger steamer "Volturno" on the high seas. Print of an original drawing by G. Martin'. The S. 174 may well have referred to a related article since the print is on page 177 of the publication. The print is large, about 13" x 8 3/4" (about 32 x 22 cm. ), & to get what I show you below I had to scan the page in two sections, join them together & reduce the image size. Since there will be many people interested in this image, the best full size image I have so far achieved is here. But it is a giant of 1883 x 1309 pixels & 594 kb in size. So you are warned that it may take a while to download. It is full of interesting detail when viewed in full size. As I tested the page, I have realised that I have not shown a tiny sliver of the work on the left side of the image. And here is a second detailed image - of the dramatic left area of the work. The right side is however equally dramatic! And I could just as well have shown you that area instead. 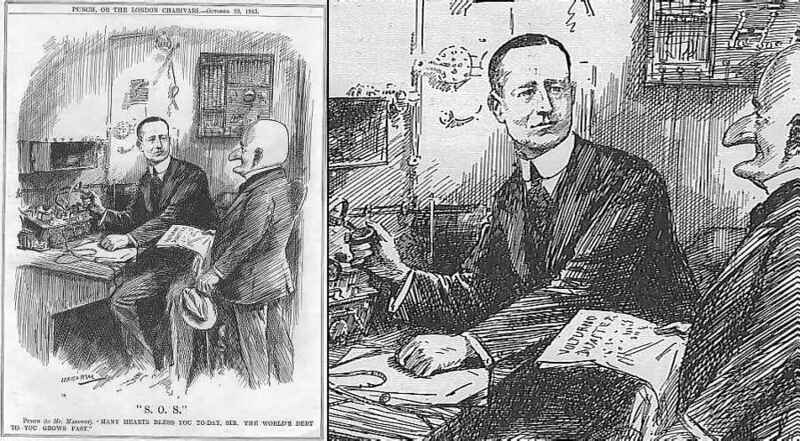 And next I am so happy to show you an image from the back page of the Oct. 26, 1913 edition of the French newspaper 'Le Petit Journal'. No artist's name is visible. It is a most striking image, so I show you almost the full work & a detail from that work. The best image I have of the entire painting can be seen here, but it is, as with the image above, very big indeed - so be warned! I now understand that there was a related article, in French of course, and thanks to Melissa Groeneveld who provided it, I can show you the French text lower on this page (I made it into two columns for display here). I had hoped that the article would confirm or deny the belief stated two paragraphs below. But it would seem that it does not. My ability in French is quite limited but the article seems to me to not refer to the specific subject matter of the print. Can anybody provide a translation to me? The issue of Le Petit Journal from which the image that follows came, sold for U.S. $9.99 in Mar. 2003 as you can read below. It would seem that today's price for that issue of Le Petit Journal is rather higher! A copy sold in late Oct. 2004 for U.S. $48.00. And it was listed at U.S. $24.99, about the same price at which one was sold earlier in that year. But truly the prices for that issue, when it comes up, can vary quite amazingly. One sold for U.S. $3.33 only (2.49 Euros actually) on Mar. 12, 2005. The laws of supply and demand I guess. The market working as it always does. 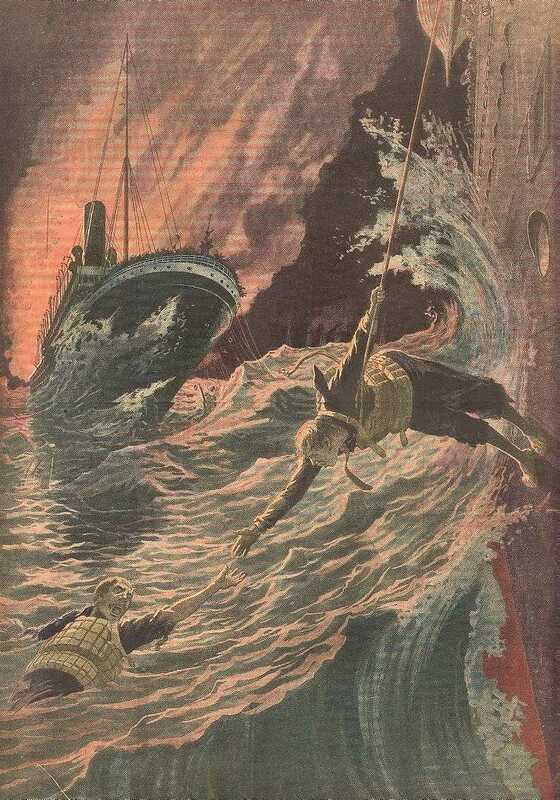 Tony Jones from North Wales, believes that this image depicts Seaman Heighway of the Carmania on a life line rescuing Walter Trentepohl from the clutches of the sea. I think he is quite correct! 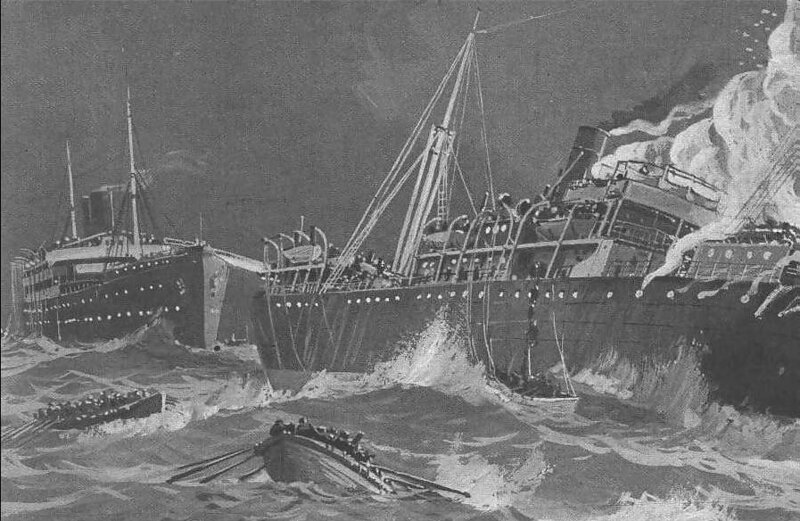 The artist may be forgiven a bit of artistic licence in depicting the Carmania, which would be the vessel at right, being so very close to the Volturno. 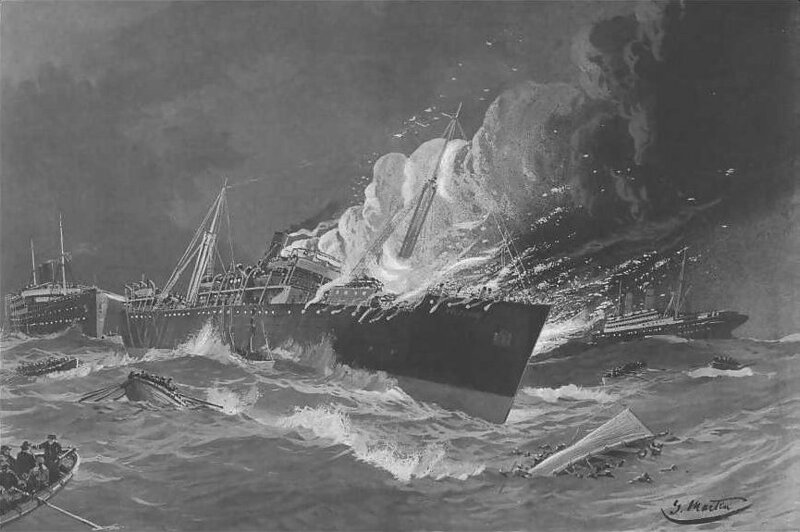 For legitimate reasons, the Carmania, a comparative giant of a vessel, dare not get so very close to the Volturno in the sea conditions for risk of a collision, not only with Volturno but also with the other smaller vessels in the rescue fleet. And Walter Trentepohl swam for an hour before he was picked up. Most probably a distance of a couple of miles, in fact, from the Volturno. 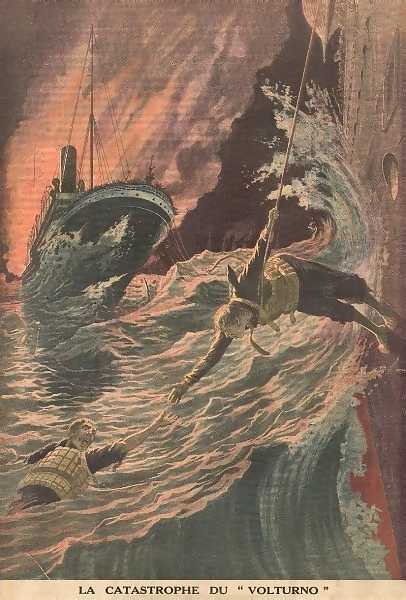 But none the less, I think that it IS Walter Trentepohl in the water & that it IS Seaman Edward J. Heighway who is depicted saving his life. Karl Baarslag, in his 1935 volume, says that for Trentepohl the English Channel would have been a lark! How very true! In July, 2010, Ellen Karp has spotted, on Amazon, a jigsaw puzzle featuring this fine image. Available from 'Mary Evans Picture Library' for GBP 17.36 - here. Custom made, of 300 pieces, 17x12 inches (or 43x30 cm) in size, ref. 610910. It would make a quite difficult puzzle, I would imagine. The masthead of 'Le Petit Journal' is visually most interesting. So I show that also. All of these images came from an item that was sold on e-Bay for U.S. $9.99 in Mar. 2003. As I have commented elsewhere in these pages, one is not supposed to use e-Bay images in this way, even though e-Bay has become, for so many, a quite irreplaceable research tool. I hope that I will be forgiven & trust that 'edupgebr', the vendor, would not object to my showing images of an item that has now been sold, for this non profit & informational site. Actually I did intend to bid on the item myself but other matters intervened. The least I can do, by way of thanks, is invite you to visit the vendor's site. The original scan was not perfectly vertical, & I lost much detail when I tried to rotate & straighten the image. So I did not rotate it & what you see it not, therefore, quite all of the actual work due to some modest edge cropping. When a full year of these 'Le Petit Journal' newspapers (1910) was sold on e-Bay in a bound volume, the vendor of that item said that he could not see that any of the artists whose work appeared in the newspapers were identified. So the lack of an artist's name re the Volturno image may not be unusual. Such bound volumes do come up for sale on e-Bay quite frequently. A copy of the 'Punch' page, which I gather is a full page & blank on the back, sold via e-Bay in early Apr. 2005 for GBP 8.50 or approximately U.S. $16.30. Another copy was sold in Jan. 2006 for GBP 3.99 or approximately U.S. $7.06. And another, in Sep. 2006 for GBP 6.99 or approximately U.S. $13.15. 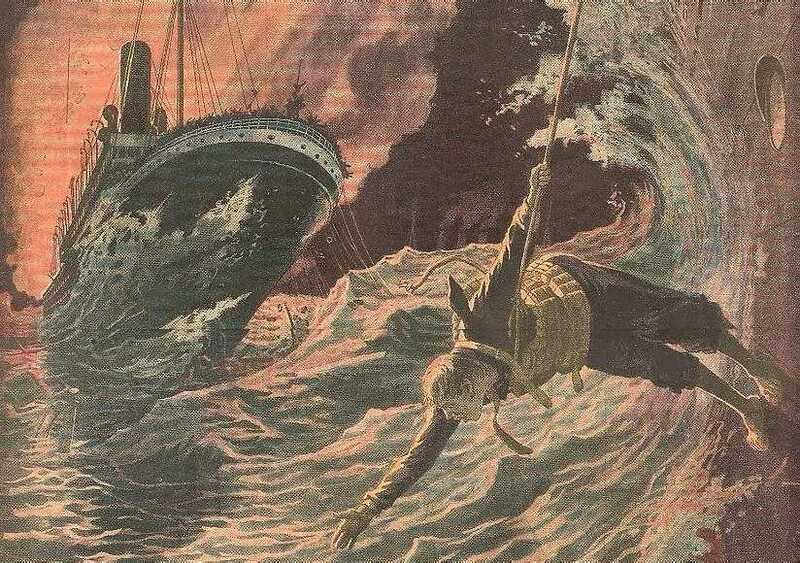 Jan Daamen, on his page available here has an image of a number of Volturno crew members including Neeltje Graauw, who may well have served as stewardess on the Volturno and died in the tragedy. To the first Thomas M. Hemy datapage & painting index page.